Free AKVIS Noise Buster Download from FilesPack.com! AKVIS Noise Buster is software for noise suppression on digital and scanned images. Digital cameras opened the door to easy and entertaining photography. However, consumer digital cameras also have their drawbacks: they often produce the so-called digital noise. It can be seen as grains that compromise the smoothness of the photo. It is especially annoying on the skin as it makes it uneven. This kind of noise is called luminance noise. There can also be chroma (color) noise which is perceived as random red and blue pixels spoiling the color accuracy of the snap-shot. 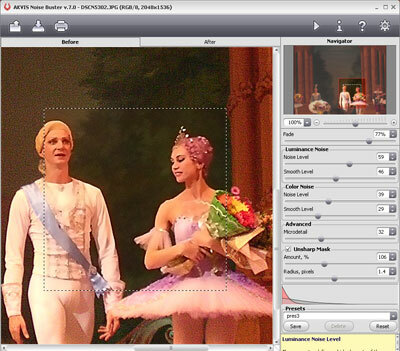 The plug-in's window shows Before and After images for instant preview and easy tweaking of the parameters. You can switch between the windows with a click on the image. Separate setting areas for luminance and chroma noise allow you to deal with each kind of noise in the most efficient way. For further adjustment you have a few advanced parameters at your disposal. AKVIS Noise Buster is a plug-in. It works under image processing programs that support plugins. It is compatible with Adobe Photoshop, Photoshop Elements, Corel (Jasc) Paint Shop pro, etc. You can free download AKVIS Noise Buster 3.0 now.